Lucy has been spayed and is now living the good life as our pet, she sleeps in our bedroom each night along with five other girls. Click on her name to see pictures of past litters. LUCY HAS BEEN THE FOUNDATION OF OUR ENTIRE BREEDING PROGRAM, MANY OF THE GIRLS IN OUR BREEDING PROGRAM ARE EITHER HER DAUGHTERS OR GRAND DAUGHTERS, SEE BELOW, BOTH ANNIE AND ABIGAIL ARE HER DAUGHTERS. BERI IS AN F1B DAUGHTER OF LUCY, SHE HAS HAD 3 PREVIOUS LITTERS, CLICK ON HER NAME TO GO TO HER PAGE. SHE HAS GONE TO HER FOREVER HOME AND IS A WELL LOVED PET. Amber is ALAA reg. born 1-11-06. very good penn hip score, vWD and PRA clear, CERF clear, hips, elbows, patella, blood, heart clear/normal. 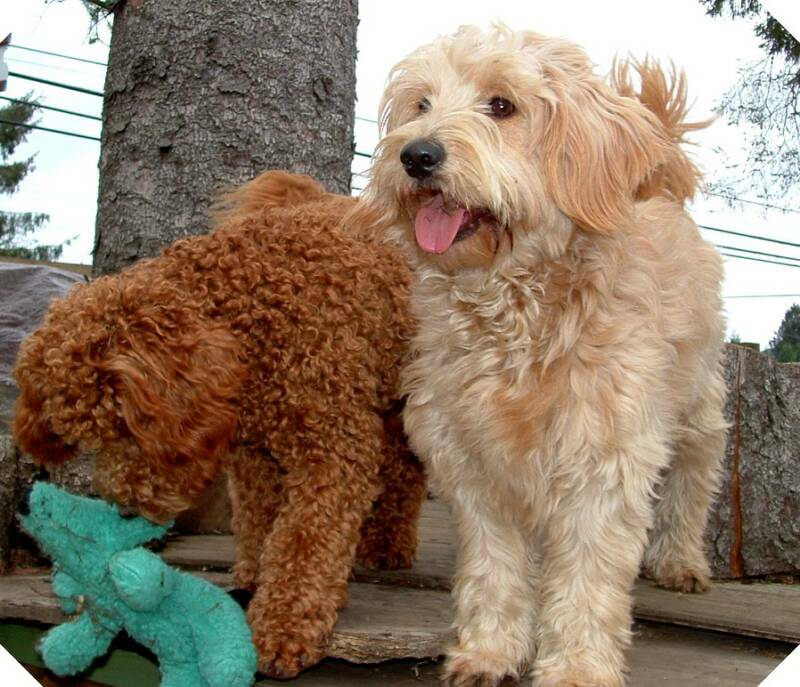 Gracie is a Maestro daughter, her mama is Heartsong Natalie from Morning Smile Labradoodles. She is ALF6 mini multi gen. Her penn hip score is 90th percentile, CERF normal, vWD and PRA clear. This little bundle of joy has a zest for life. She 19 lbs and 15", a true mini. ALAA reg. Sami is a miniature 6th gen. multi generational. Sami carries the parti color gene. She is hip, elbow, CERF, patella and cleared for vWD and PRA thru parentage. Sami lives in a guardian home in Washington State. Sami lives with her guardian family in northern Washington, she is retired from our breeding program. Liza, as her guardian family calls her, is chocolate/white parti. Her deep dark chocolate colors sometimes shows up as black in pictures. 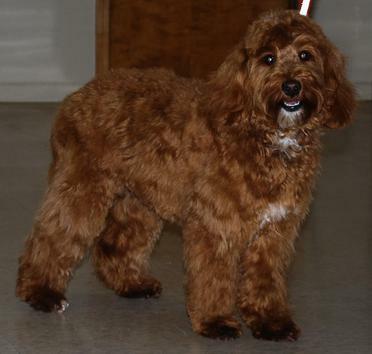 She is medium size 4th generation American Labradoodle. ALAA registered. She is cleared for hips, elbows, blood, vWD and PRA and CERF. LIZA IS NOW RETIRED AND LIVING WITH HER GUARDIAN FOREVER HOME. Magic was born 8-6-2006, she is ALAA reg. and fully tested. She lives in a guardian home in Southern Oregon and is their very special pet. She is a daughter of Maestro and out of Carla's Liberty Rae Faribanks. 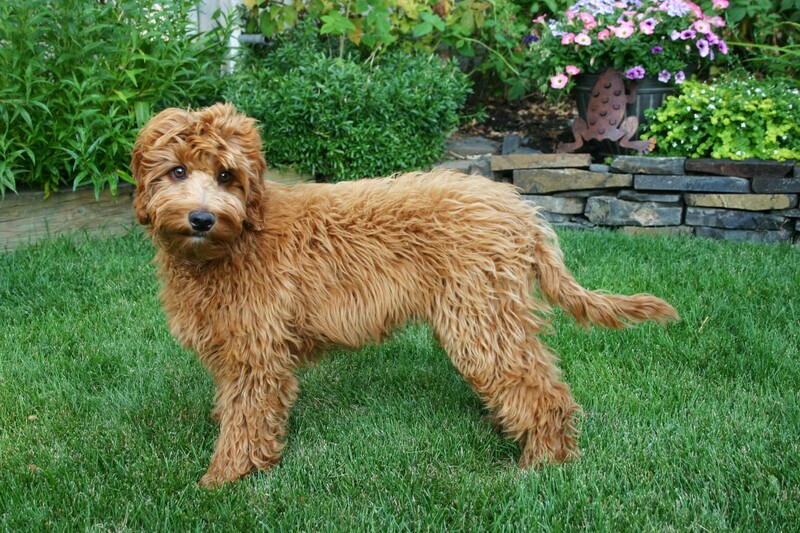 She is a 3rd generation Australian Labradoodles. Magic's next litter will be fall or winter 2009. MAGIC IS RETIRED FROM OUR BREEDING PROGRAM. Roni's guardian family calles her "Sophie". She is a 3rd gen. daughter of Annie and Maestro born 12-05-06. She is a well loved pet. She has passed all her testing with very good results. Sophie has a gorgeous non shedding curly fleece coat. She loves life and lives to play and be a part of her loving guardian home. She is OFA excellent and all testing is good. 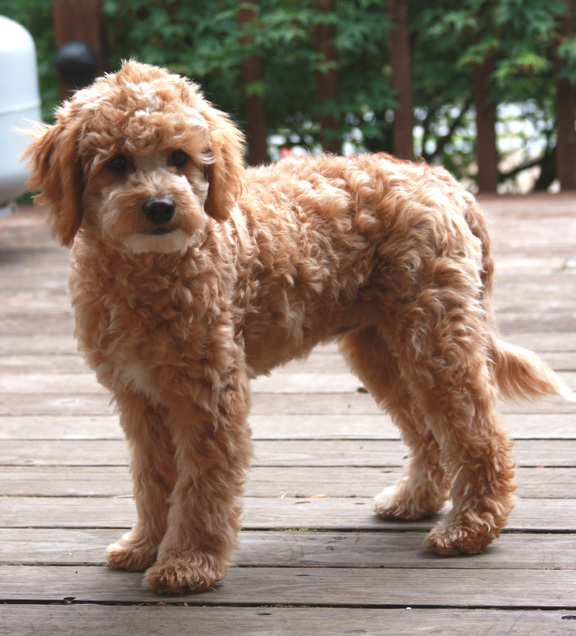 Velvet is a 4th generation American Miniature Labradoodle. 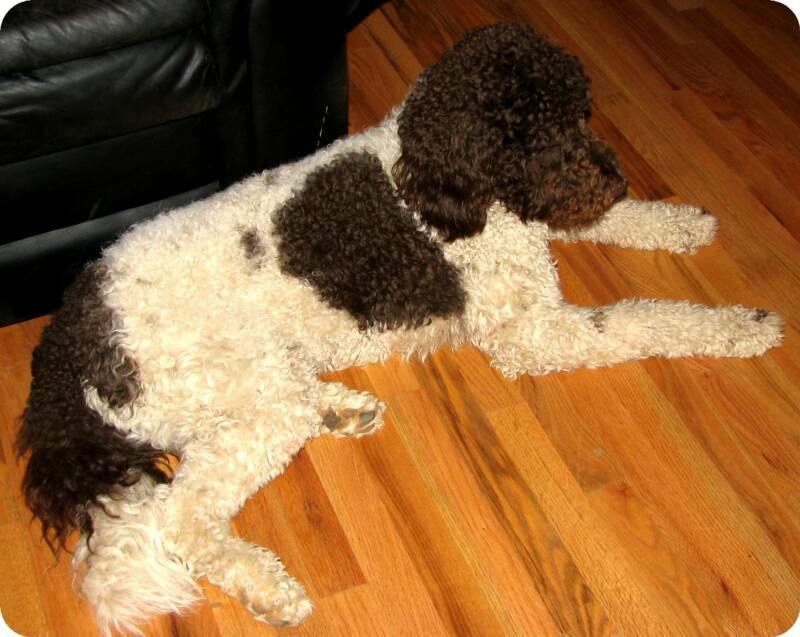 She has a mini red poodle daddy and a 3rd generation black/white parti colored mama. Velvet was born 12-1-2006. She has had her last litter July 8, 2010 She is the mama of springville Samba (see our boys page, he is red/white parti.) Velvet lives in Salem, Or. with her guardian family and is very well loved and pampered. She is Penn Hip 90th percentile and all good testing. LISTED BELOW ARE RETIRED BREEDERS WHO HAVE CONTRIBUTED GREATLY TO OUR BREEDING PROGRAM. THE GIRLS WHO ARE STILL IN OUR BREEDING PROGRAM ARE DECENDED FROM THESE GIRLS. Kirby, as her guardian mama calls her, is a daughter of Annie and Maestro. Born 1-16-08. 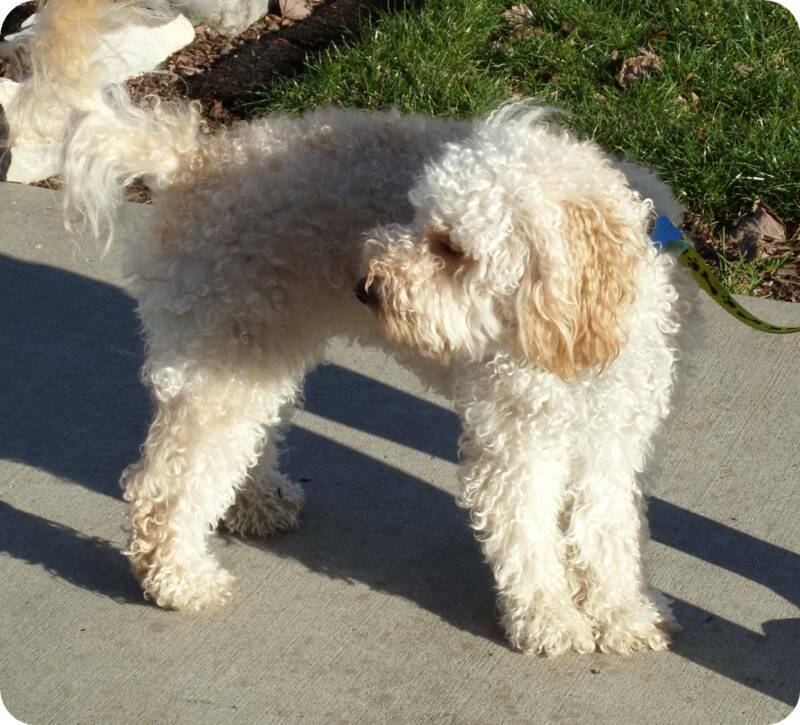 Kirby is a very lucky girl who gets to go for daily walks with Krissy. Kirby has passed all her testing with very good results. Kirby had one litter of 3 puppies and this will be her one and only litter, she is now spayed and lives with her guardian mama forever. Alley lives in a guardian home in Albany, Oregon, she is a daughter of Cheyenne Valley Oreo Cookie and Tobin from River Mist. Born Sept 2009. Alley has completed her breeder testing. Alley is OFA excellent hips, elbows normal, CERF normal, blood and patella normal. She is a medium size. 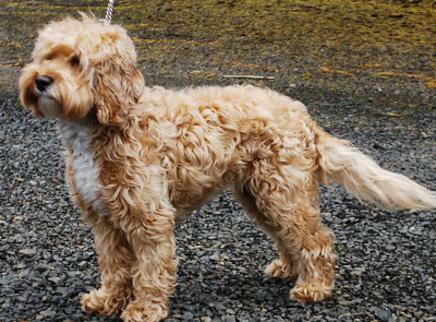 Alley is a beautiful chocolate/white parti with a gorgeous non shedding fleece coat. She has her very own boy to love and adore her. Mattie was born 10-9-2009, she is a daughter of Peppermint Patti and Max. 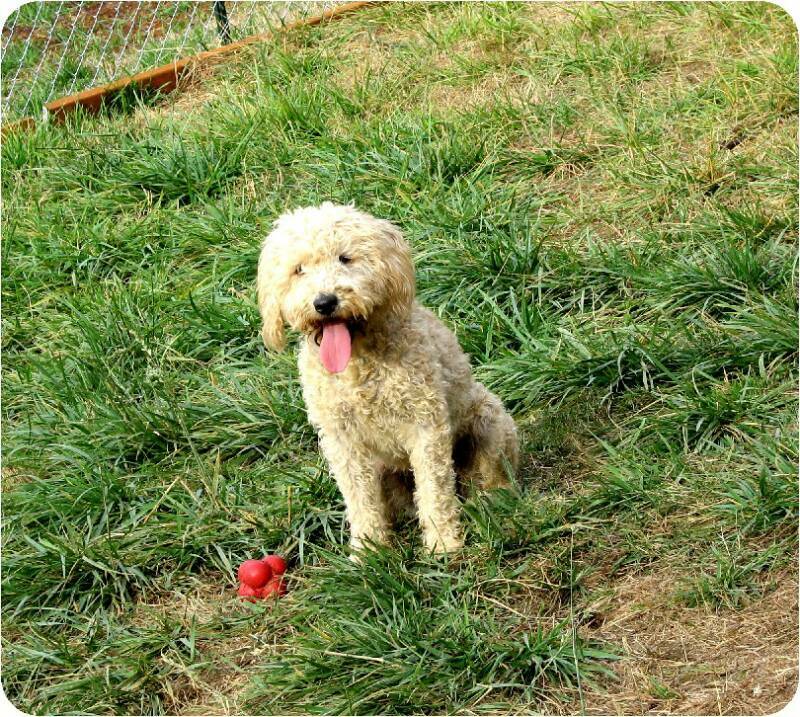 Mattie is a rare gold/apricot/white parti and she is considered to be a large mini or small medium in size. Mattie has passed her breeder testing and is just growing up and enjoying life and playing ball, she is mischievous and playful. Mattie has a gorgeous non shedding fleece coat, soft as silk. Pixie is a sweet little love born 1-31-2009 to Annie and Mars, Pixie had one litter sired by Dandy and she has many many problems so she was spayed after that litter and is now living in Arizona as a well loved pet. Lily is a cuddle bug, we love this girl, she lives in a guardian home in Amity, Or. she is silver/black in color and she is sister to Springville Samba who is on the our boys page. Samba is a red/white parti boy. 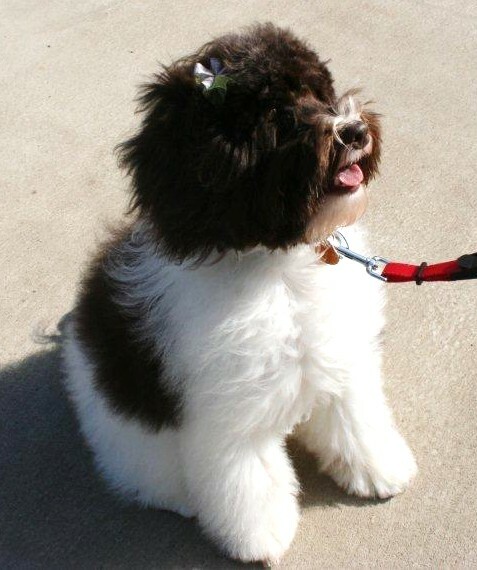 Lily was born 11-8-2009 and she has passed all her breeder testing with excellent results. In this picture Lily had just gotten a scissor cut so she apprears to be a hair coat but in reality she has a very nice non shedding straight fleece coat. She carries strongly for red and parti. She is a little girl, just 15 lbs so her puppies will also be small. 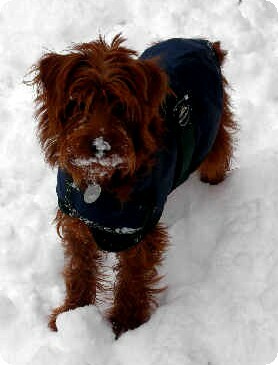 Her mama is Velvet and daddy is Mars, see our girls and our boys page of web site for pix of parents. First litter in 2011, we are excited. Lily is now retired and living with her forever family. Desi is a cute little bitty girl, daughter of Beri and Mars born 2-9-2009, she has passed all her breeder requirements She has a gorgeous non shedding straight fleece coat. She is light red/apricot colored. Desi is just 14 lbs, Desi lives in a guardian home that will be her forever home after her next litter. 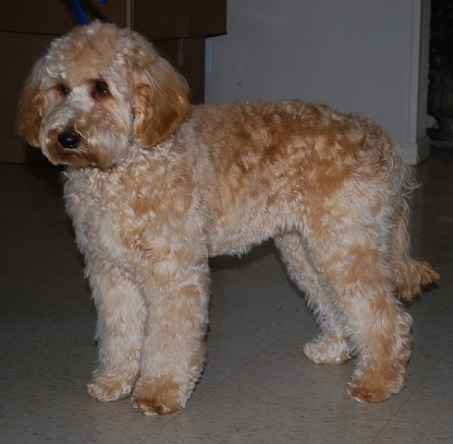 Cassie is a medium size labradoodle born March 10, 2010, she has a gorgeous non shedding fleece coat. 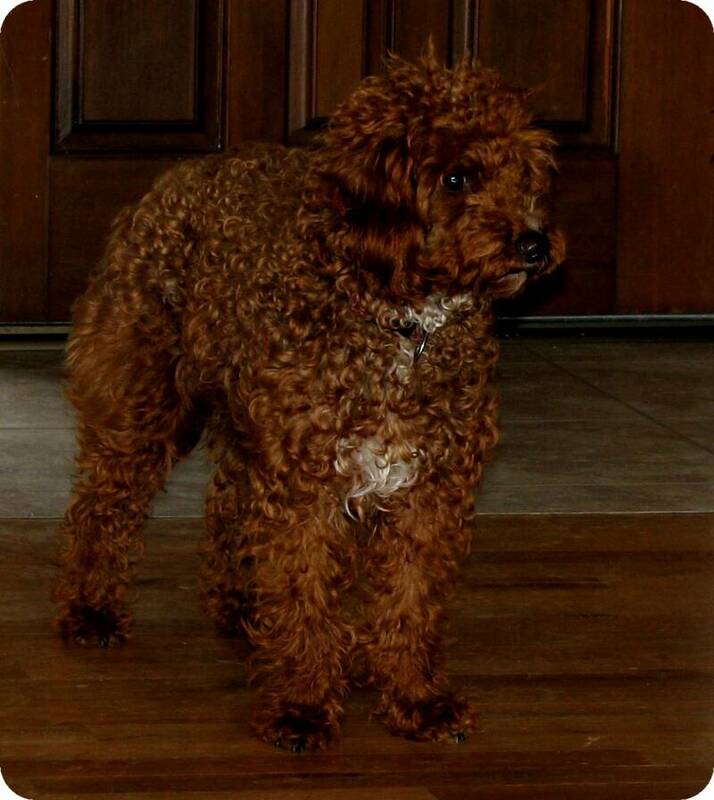 She is a 4th generation Labradoodle. Maddie did not have puppies, she appears to be unable to have puppies so sadly we have retired her from our breeding program. This beautiful girl is named Bella, she is a full sister to Sam, Karma, Tilly and Charmer. 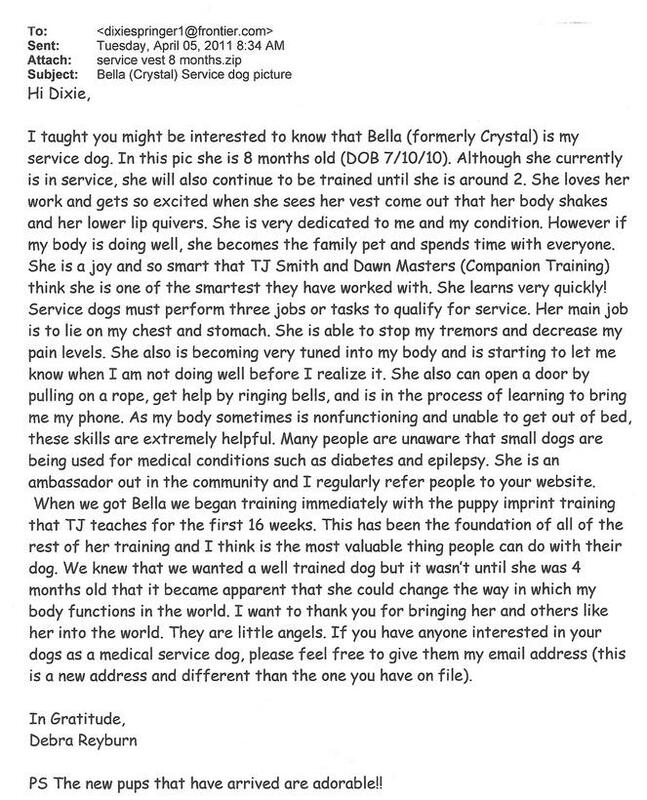 Her parents are Velvet (see below) and Mars (see our boys page) Bella is now a service dog, the email below tells of her training and how she is able to assist her human mama with her health issues. 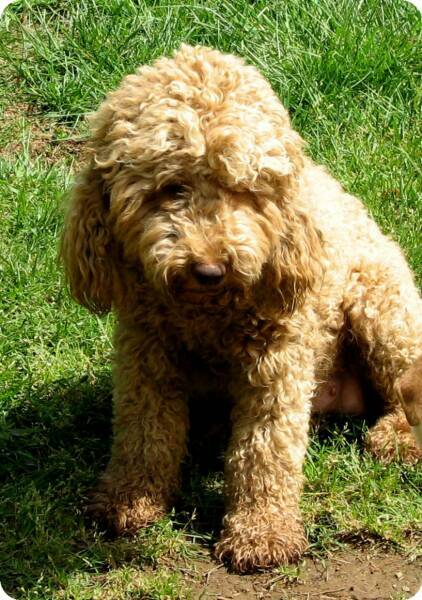 When Debra contacted me about a Labradoodle who would be able to assist her I had a strong feeling that Bella was the dog for her, she is so very smart, responsive and intuitive. 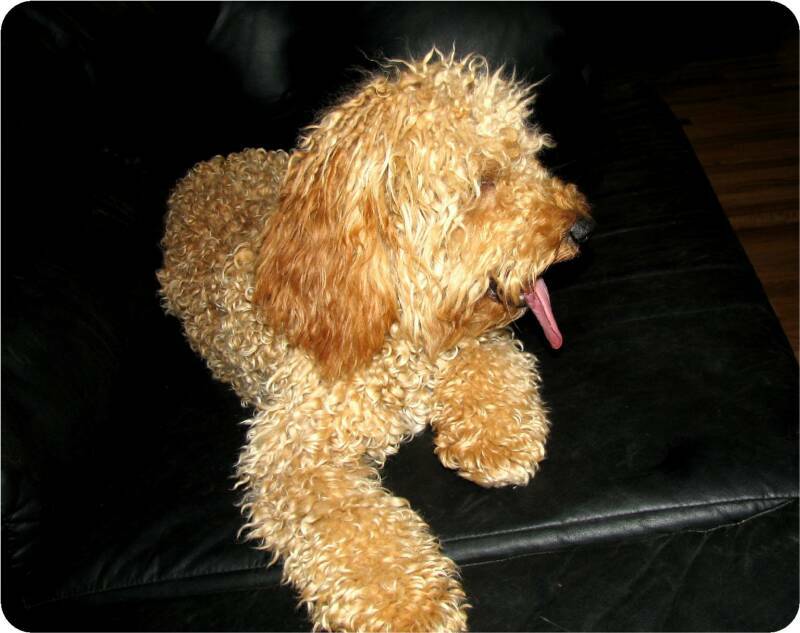 Bella is a well loved pet providing a valuable service for her owner. Charmer lives in a guardain home in Portland, Or and she is called Pepper. Charmer is a full sister to Chatilly and Karma. She has a shiny black coat and she is a people person, she loves everyone. She currently weighs 19 lbs and is 16" tall. 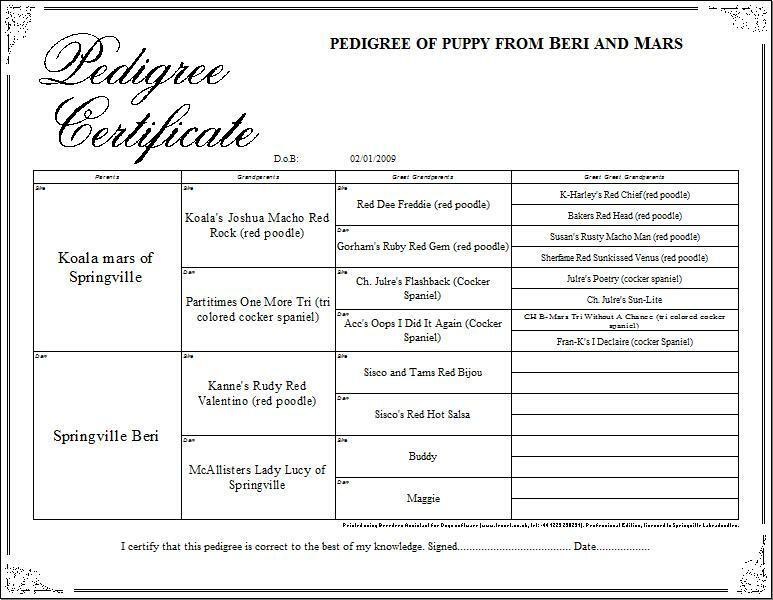 The black color will help any red puppies that she produces to hold their red color better, she does carry for red and parti. Charmer is the mama to Prince. Tara lives in a loving guardian home in Newberg, Or, she is a sweet little love. 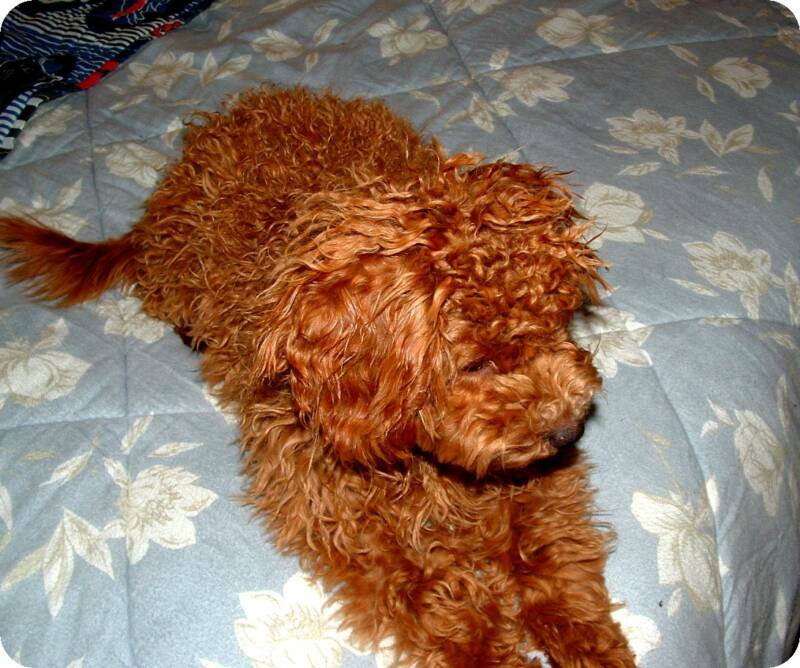 She is light red in color and carries strongly for red, born April 2012 she will have her third and last litter around the first part of Sept. 2015 Her mate will be Prince so the puppies will be a mix of new and well established Australian Labradoodle bloodlines. TARA IS NOW RETIRED AND LIVING THE GOOD LIFE WITH HER GUARDIAN FOREVER FAMILY IN NEWBERG, OR. Springville Karma is a full sister to Chantilly and Charmer. She is a playful little imp and loves her ball with a passion. Born July 2010 she is a small mini in the 17 lb range. She is new bloodlines. 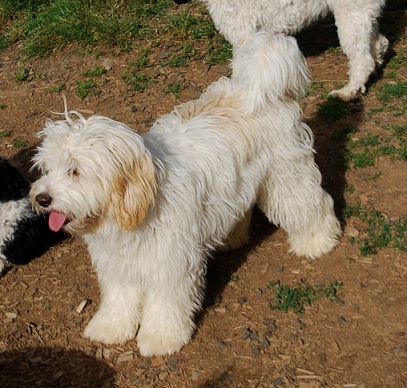 Adorable, sweet, lovable, very cuddly, this perfectly describes our little Daisy Doodle..
She is full sister to Gresham (see our boys page) and both of them have them most wonderful temperaments and beautiful fleece coat. 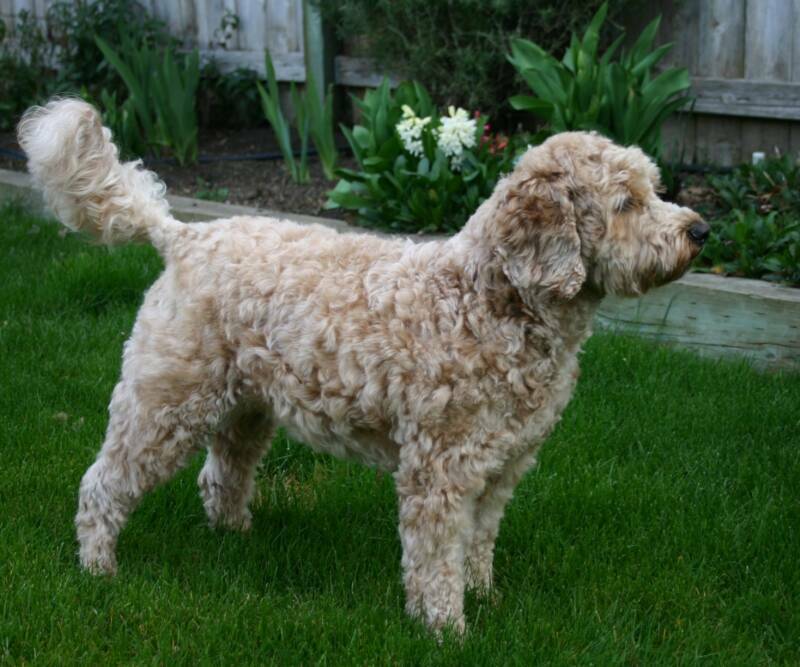 DAISY IS NOW RETIRED AND LIVING WITH HER FOREVER FAMILY IN FOREST GROVE OREGON, SHE IS THEIR WELL LOVED PET. Romey's last litter will be mid May of 2016, it will be a repeat breeding of the litter currently pictured on the nursery page of web site. Romey's full sister Zoey will also have a litter by Gresham in 2016 so the two litters will have identical pedigrees. This girl is called Sofie by her Guardian family, She is an adorable little love bug with a beautiful soft fleece coat just like her daddy Prince. Born August 16, 2015 she is just growing up and loving life. Her first litter should be some time in early 2018. Her page will be created some time in the next couple of months. Her mama Daisy is one of our retired breeding girls who is a full sister to our stud boy Gresham, click on his link. Sofie is in the 20 lb range.